← GROW A SURVIVAL GARDEN NOW- for you and your rabbits! I get excited about a few things (most are homestead related), but rabbits and comfrey are at the top of my list! There are so many uses for comfrey on the homestead everyone should grow it. This amazing plant can be used as a livestock food and tonic, herbal medicine, organic fertilizer and mulch for you gardens, and a great booster for your compost piles! I will list as much as I know about comfrey on this page. The first time I got Comfrey was back in the early 80s and even when moving from place to place, I would dig up roots to bring my comfrey with me. Back then I was only growing it as a food and tonic for my rabbits. As I started learning how to use it more and more in the gardens, greenhouses, and compost piles and then seeing the results of what Comfrey can do. I was amazed! I started many more comfrey beds and planted it around my gardens, fruit trees, and compost piles for easy harvest and use. Comfrey is a high-yielding leafy green perennial herb, and a member of the borage family. I use, grow and sell, Russian Bocking 14 Comfrey, Symphytum uplandicum. In 1954 Lawrence Hills began researching the use of Comfrey. He found that it mines nutrients in the ground by using its deep root system. When plants do this it is called a dynamic accumulator. The plant will draw minerals out of the soil and into the roots, stems and leaves. This makes comfrey very rich in the basic N-P-K elements which are the basis of all plant fertilizers and are important for plant health and growth. Comfrey contains useful amounts of these trace elements but nobody seems to have researched this until Hills went on to develop the most useful variety of Comfrey, Bocking 14, which was named after the location of the trial grounds in Essex, England. The most important property of Bocking 14 is that it is sterile. That means it does not self-seed so it does not spread like wild Comfrey. But once you have Comfrey in the garden you will never get rid of it as even the smallest piece of root will regrow vigorously. But then why would you want to get rid of it, with its so many uses! Comfrey grows up quick and early in the spring and can easily reach heights of 5 feet. The lower leaves are very large, compared to the small hanging clusters of flowers at the top of the plant, to which I have never seen so many bees as in my comfrey beds, they love the purple flowers as do a great many other beneficial insects. The shape and size of this plant makes it look like a shrub but comfrey is a herb. Comfrey is a hardy perennial and it will die back to the ground in the winter and regrow in the spring. Comfrey will adapt to most areas you want to plant it, but will thrive in a rich organic soil. As with all quick-growing plants, Comfrey needs nitrogen. Comfrey gets all its nitrogen from the soil, so some type of regularly added organic matter is needed. Of course I cannot think of anything better to use than Bunny Berries! I top dress my Comfrey plants every spring and fall! When starting Comfrey plants I use root cuttings most often. These cuttings are usually available in small and larger sizes. The larger roots will sprout and grow faster than the small cuttings. These are 2-6″ lengths of root which are planted horizontally 2-8″ deep. Plant shallower in clay soil and deeper in sandy soils. You can also grow comfrey from crown cuttings, but these will be more expensive. A crown cutting will include sprouts and will grow faster than root cuttings. Crown cuttings are planted 3-6″ deep. If you are growing several plants of comfrey for a bed, and regular harvesting, space them in a grid, 3′ apart. Once Comfrey is established it will take care of itself. Each year the plant will get a little larger and the root system will get more dense. A Comfrey plant can live several decades before it begins to decline. By dividing the plant every few years this will keep the plant growing vigorously longer. Because of its deep tap-root, comfrey is very drought tolerant. However regular watering will keep it green, growing strong and blooming for a great quick harvest. Comfrey leaves can be harvested and dried at any time in its growing stage. If you are growing it to harvest the leaves, you can make your first cutting when the plants are 2′ tall. Cut back to within a few inches of the crown. If you begin harvesting early, you may not get flowers that year. I have many comfrey plants all over the homestead and for many different reasons. The plants around my garden I let flower. These purple bell-like flowers draw in so many beneficial insects to help pollinate my crops. By planting Comfrey as an outside border the plants roots mat together stopping even couch grass from creeping in. I do plant them closer about 24 inches apart as a garden border and the plants are right were I need them when I want to use as a mulch. There are so many great ways to use comfrey around the garden! One of the easiest uses of comfrey is as a thick mulch for other crops. Comfrey leaves and stems can be cut and wilted for a few days and then used as a mulch. This will slowly release all the nutrients that their long tap roots pulled up from the soil. This will also help to suppress weeds, feed the plants being mulched, and conserve moisture. This is especially good around plants that like a little extra potassium like fruits, squashes, potatoes, and tomatoes. Researchers in British Columbia analyzed the NPK (nitrogen-phosphorus-potassium) ratio of comfrey and discovered that the leaves have a remarkable NPK ratio of 1.80-0.50-5.30. When we compare these nutrient ratios to that of animal manure we can see how far superior comfrey is but the bunny berries are still better than most manures! As comfrey leaves wilt an decompose they become irresistible to slugs and snails. If you spread them around young plants such as lettuce and other slug loving plants this will keep the slugs busy and easy to dispose of. The wilted leaves and stems (by wilting the pieces of comfrey they will not root) can be dug into ground that is being prepared for a new crop and they will break down to give an awesome organic feed to the crop that is being planted. I always do this with all seedlings I transplant outside. This works great on plants being grown in containers as the comfrey decomposes it makes a slow release fertilizer for the plant. Great to add in when you trench in your potato starts in the spring. Comfrey as a liquid fertilizer is the best! This is one of my favorite uses. Throw that Miracle Grow and any other chemical fertilizer out! Comfrey leaves and stems (I chop the stems) can be crammed and packed tight into a large container (I like using 5 gallon buckets) with a brick or rock pressing down on the mass of comfrey. After a few weeks the mixture will be like a green, brownish soup and ready for harvest. Strain it through a fairly fine screen and bottle, then put the screened sludge remains onto the compost pile. By putting a spigot on the bottom of the bucket you could just keep adding comfrey to the top as it breaks down and turn the tap on as you need it. Once this liquid fertilizer is made it should be diluted from 10:1 to 15:1. Some people I know just add cut and chopped comfrey plants to their rainwater barrels, then let sit for a few weeks and use this to water their plants as is. They have all had great results. Because Comfrey is a high-nitrogen source, Comfrey is a wicked awesome compost activator and a great booster for the compost piles, it will even awaken those cold dead piles! Remember when composting to always have the right balance of green and brown shredded material in any of your piles to keep them healthy and composting. Comfrey when added to the pile works best as an activator if it is well mixed with the whole pile rather than just adding it as layers, this will kick-start your hot composting process. You can add as layers if your pile is working and you just need to add some green stuff. Here is a recipe for the Rise And Shine Comfrey Composter Super Booster Fill your blender 3/4 full with fresh comfrey leaves, then add water to about 2 inches below the rim. Blend until the comfrey is dissolved. Pour the undiluted blended comfrey into your composter or on your compost pile. It will get your compost heating up fast! It’s an excellent compost activator because it contains more nitrogen than most manures. A few years ago I planted some Comfrey plants next to my compost bins and their growth has been awesome, it is in a shady area on the homestead, most plants would never even grow there. The Comfrey grows vigorously while enjoying the leaching nutrient’s from the pile. The comfrey is also close to the compost pile to add as green matter, If I add some dry matter to the compost pile. I get three good crops of leaves each year from each plant here in Maine, it can be cut right down to 2” above the ground and then it will re-grow fast. Remember to keep an eye on it, splitting off some of the root every few years to prevent it getting out of control, but you can propagate these cuttings into as many new plants as you want, to start new beds, and plants, to barter, sell or give as gifts. Comfrey is also used as a livestock food. Farmers in both Japan and in the Pacific Northwest plant fields of comfrey to feed both their dairy and beef cattle. These farmers are getting remarkable results in the health of both their beef cattle and increased milk production in their dairy herds. The Henry Doubleday Association in the United Kingdom long advocated the use of comfrey as a nutritional supplement for farm animals. Comfrey contains many vitamins and nutrients such as Vitamin B12, potassium, sulphur, calcium, iron, phosphorus, Vitamin A, Vitamin C, Vitamin B-complex, selenium, iron, germanium and is also an excellent source of protein. I feed comfrey to all the livestock on my homestead. The chickens love it, when the free ranging chickens get to run in the comfrey beds they will eat it to the ground. The pigs go crazy when they see you carrying in to them grunting and doing their happy dance. I have fed it to my rabbits for 30+ years and they love it! So far, I have had no adverse effects on feed comfrey to any of the livestock I raise here on the homestead! I have been told lots of negative things on feeding comfrey to livestock. Studies have reported the development of cancerous liver tumors and liver damage in animals after ingesting or being injected with various amounts of comfrey. If comfrey is so dangerous, then why is it not causing liver issues to the cattle raised in Japan? The cattle are being fed large amounts of comfrey yet there has been no problems with liver tumors or liver damage in their herds. I feed comfrey to my rabbits as much as 25% of their daily green feed. I butcher my rabbits and all the livers are healthy and tasty! I have never personally had any problems with comfrey being fed to the animals on my homestead. I researched a few of the negative comfrey studies, the ones I could find were done on young rats. The Comfrey was not given to the rats as a food source, Instead the toxic alkaloids were isolated and injected into these rats. As with many herbs, the whole plant contains elements and nutrients that can neutralize the toxic elements in the plant being eaten. So by isolating and injecting a toxic chemical from the comfrey plant and eating the leaf of the plant, you would get different results in any study. So do some research yourself and make your own choice. I will be using comfrey as a food source for my animals! In herbal medicine it is sometimes referred to as “knit bone” for its ability to speed wound healing. Knit bone, refers to the way that the Comfrey was ‘knitted’ (wrapped) around the bruised leg or arm. The allantoin content of comfrey, especially in the root, has resulted in its use in folk medicine for healing wounds, sores, burns, swollen tissue, and broken bones. When applied externally to bruising, sprains, arthritis or any inflamed tissue, it acts as an anti-inflammatory and pain reliever. In studies allantoin appeared to affect the rate of cell multiplication. Wounds and burns seemed to heal faster when allantoin was applied due to a possible increase in number of white blood cells. Comfrey works so well that it is important to ensure that when using it as a healing poultice, the affected area or wound is completely clean and free from dirt or foreign matter. This is because Comfrey causes the skin to grow back so fast that any dirt left behind will actually end up being stuck under the new skin growth. You can apply cold grated comfrey root or a cloth soaked in cool comfrey tea to sunburns or other minor skin burns. Comfrey can be used as a treatment for rashes, scrapes and especially insect bites and stings. Making a poultice with the juice can remove warts and other growths. Can be used as a rinse for skin problems on livestock and pets. Comfrey Infused oil is used to treat arthritis, skin wounds and diseases such as psoriasis. Juice from the leaves and stems in a terrific cure for poison ivy. You can make an infusion by boiling the leaves. For using the plant externally, the whole plant can be beaten and heated up, then applied to the skin. To make comfrey oil, clean some fresh comfrey roots with a scrub brush under running water. Place the roots in a blender or food processor with olive oil to cover, and grind as fine as possible. Put into a large glass jar and allow to soak for several weeks before straining. Filter through a wire mesh strainer with cheesecloth or in a coffee filter. This can be used as a compress or poultice. Comfrey should never be taken internally. Most health agencies in the U.S. have banned the internal use of comfrey due to the pyrrolizidine alkaloids found in this plant. 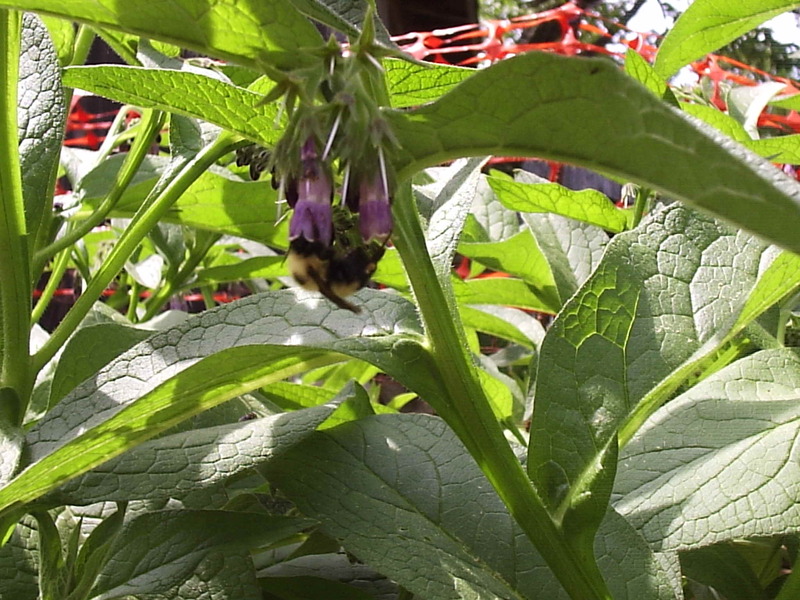 Comfrey is no longer sold in the U.S. as an herbal cure, except in creams or ointments. In the past before the bad press on comfrey they did use it internally. Drinking a few drops of Comfrey in water can help with bronchial problems, particularly whooping-cough. Boiling the crushed root yields a mild remedy for diarrhea and other gastro-intestinal problems. Use any of the cures here use at your own risk. I am not a doctor. These are old remedies’ that have been used for generations. Comfrey is nature’s answer to a sustainable fertilizer, fodder, and healing herb for the Homesteader. Best of all it is free! and you can grow it yourself! Comfrey is The Gold Mine on the Homestead! We have Comfrey available for sale. https://riseandshinerabbitry.com/comfrey-for-sale/ . I am working on a YouTube video showing all these uses. Join The Rabbit Revolution! Posted on August 11, 2013, in Uncategorized and tagged comfrey, compost, feed, flowers, fodder, healthy-living, herbs, leaves, medicine, organic, organic ferlilizer, plants. Bookmark the permalink. 14 Comments. Wow! I am very impressed! I never knew comfrey had so many uses, will be using this for my rabbitry! Why do you say that it should never be taken internally yet rabbits and cattle take it internally? I’ve eaten it or made tea from comfrey leaves for over 30 years and never had a problem. I recently ordered a bad or organic dried comfrey. I was very disappointed when I saw that the label said “for external use only”. I see that you’ve touched that a little bit above. It’s fine for rabbits in any case? The above message should read *bag of organic dried comfrey. Hope this answers any questions, thanks for reading! Excellent article. I use fresh Comfrey infusion when I have a Lyme disease episode and for poulticing various aches, pains, wounds. Very soothing. All things in moderation, Comfrey IMHO is a powerful herbal tool. A future project on my homestead is to divide some plants and grow them under my fruit trees as a groundcover. My free range chickens do not eat my Comfrey. After reading this most interesting article I see why Comfrey would provide excellent nutrition for the orchard. I have a cow with a knee injury and read that Comfrey would aid in the healing process. I bought a bag of organic dried comfrey, but I do not know how much to add to her feed. Please advise. For injuries like that a comfrey poultice would work the best. How can you be sure your getting Booking 14 & 4. I would like to purchase some plants of each. Can you email me some prices & information. Reblogged this on Thurza Grace Botanicals.